There's something a bit special about baking bread. I'm a child of the supermarket generation. For the first 30 years of my life bread came from supermarket shelves or occasionally from a Baker's shop, or even more occasionally from a Farmer's Market of farm shop. And then I baked a loaf at home, then another and another and another. I think the fascinating thing is the yeast thing - it's alive. And homemade bread smells delicious, something exotic and unusual yet so completely everyday and ordinary. Yes you can buy a loaf, it doesn't cost much, but baking your own is so easy and will make you feel accomplished, trust me. This is my recipe - I've tinkered with it long enough to enable me to say that I hope, and I've made it many times. I initally baked it freeform on an oven tray but one day Greig brought me home a loaf tin - what? He's romantic like that........or just really likes bread. Anyway, the loaf tin took my bread making to a whole new level. It makes - well, loaves - loaf shaped hunks or deliciousness. Read on bakers, and get your bake on. 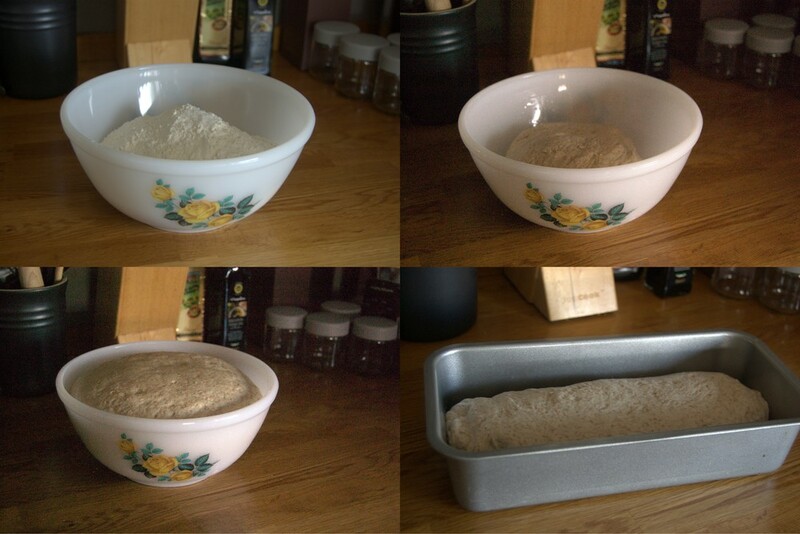 These are what you'll need to make my favourite loaf, but the variations are endless. I like a half and half mix of wholemeal and white flour. A white loaf is nice too but the wholemeal gives a lovely sweetness and earthiness and lets face it a bit of smugness. A wholemeal loaf might be your bag but I was not happy with the brick like consistency but maybe I just need to experiement more. I'm a half and half girl. You need to reactivate the yeast by popping it into the water with a sprinkle of sugar. A sprinkle is I'd guess a teaspoon or two? The water needs to be warmish. I would say baby bath warm, not dishwater warm. Leave the yeast to foam up a bit, 5-10 minutes? It will look scummy when it's ready with foam on top - don't worry, this is a good thing. Pop your flour in a big bowl, add 2 tablespoons of honey, a tablespoon or so of oil - sunflower is fine and salt. This is where I ran into problems with the first few loaves I made. They were bland and tasteless and I had to ramp up the sweet and salty to give them some flavour. Which makes me shudder to think about how much there must be in shop bought loaves. I would say you probably need at least of salt, I use more. If you want to add more next time, you can. You will be baking this again, oh yes you will. Make a well and pour in your scummy yeast mixture. If you can, retain a little water which you can add if your mix seems dry. If you schlep the whole lot in and it seems wet, no matter just add a bit more flour - no harm done. I bring the dough together with a fork and then set about kneading the stuff. I take about 10 mins, with no technique other than what I've witnessed on tv. Stretch, fold or get a 4 year old to bash it for you. It should start to feel quite silky and pliable. Now you need to quickly wash your bowl and run around the inside with some oil so your dough can rise smoothly. Pop your doughball in and cover with a teatowel and leave somewhere warmish for an hour or so. Your dough should double in size in this time, if it seems a bit slow, give it longer and perhaps perch it near a radiator. Now punch all the lovely air out of your dough and knead for a couple of minutes more. If you have a loaf tin - a large one - you can make a sausage shape and stick it in. If not a baking tray will be fine but your loaf will be a more rustic bloomer shape. If you want seeds on top egg wash and sprinkle them on or roll your sausage in seeds before you put it in your tin. Again leave for an hour. Your loaf should rise again in this time. Preheat your oven to 200C. If you like you can put a small container of boiling water on the floor of your oven to give a nice crust and bake your loaf in the centre of the oven. It should take about 30 mins to bake, to check it's ready you can tap on this base of your loaf and it should sound hollow. Once you've started I should warn you, bread baking can draw you in. Fruit loads, baguettes, bread rolls, all of these and more are just as easy to make. If you're not a confident cook but are having people to eat just make a big pot of soup and whip some homemade bread up, your guests will love that you've made the effort. (what effort? 10 mins of kneading, sneaky eh? ).